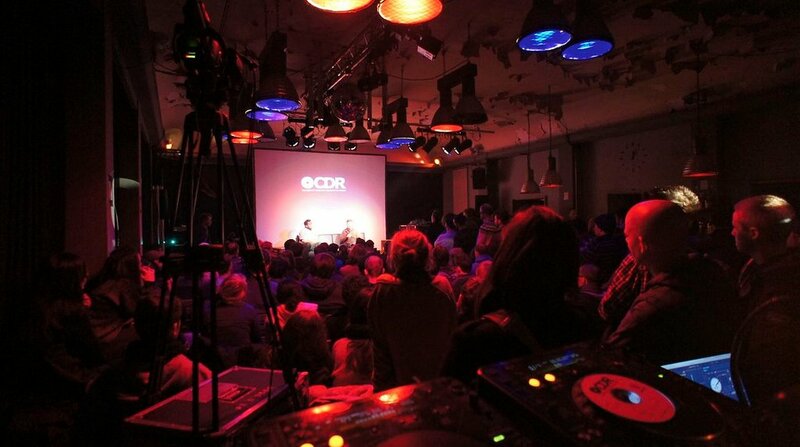 CDR events offer musicians a chance to play tracks - finished and in-progress - on a professional soundsystem, and in a constructively critical environment, CDR sessions have taken place in multiple international locations for over a decade. The genesis of CDR goes back a decade to the creative process of founder Tony Nwachukwu. A producer and DJ, Tony sought to expose the process behind the tracks he was producing and DJing, while also fostering a community of like-minded producers for learning and exchanging ideas. CDR events started in London as an opportunity for musicians to hear finished and in-progress tracks mixed on a professional system, in a constructively critical environment. Having since expanded to include new locations and even a radio show, Tony has used CDR sessions as an opportunity for public discussions with artists - such discussions often feature unparalleled depth in discussing process and setup for the artist featured. In advance of the CDR discussion with Ewan Pearson next Monday during the 20 Jahre Kompakt pop-up store at Ableton HQ, we sat down with Tony to get some background on CDR, his musical influences, and what keeps him learning and exploring a decade in. Why did you first start CDR in London? How and when did it happen? CDR first started in London as it is where I am from and a city whose (then) music landscape inspired the concept. The idea came about whilst DJing at a warehouse party in Old Street in 2002. Some of the tracks I played were in varying states of completion, but it dawned on me that I was the only one who knew each track’s level of completion. I thought it would be interesting to explore an event where everyone could listen to each other’s tracks, regardless of their level of completion. I wanted to challenge the notion of 'what is finished?' This has spawned into a framework that includes Archive (a DJ set of tracks submitted at previous sessions); Open CDR submissions on or before a specific session; and Works and Inspirations (DJ sets or performances by producers and labels). The first event happened at the Embassy, a basement in a North London pub; but the room was full of 'heads'. I knew I was onto something. After a brief stint at the Bridge n Tunnel, CDR found its long-term home at Plastic People, where it continues its monthly residency. In recent years, creating learning opportunities became a focus and led to CDR Knowledge, iOS Music Meet and Beats Sunday Dinner. How did you end up expanding CDR to other cities? Do you find that anything differentiates the events between one city and another? Since its inception and with roots firmly in London, CDR has travelled throughout the UK, and then across the pond to Barcelona, India, Tel Aviv and Paris - most of which were bespoke projects. I suppose these were works in progress, leading to more long-term relationships with sustainable homes, labels and producers, enabling us to explore ways to connect communities of producers. CDR now resides in Berlin and Copenhagen on a bi-monthly rotation, with more in the pipeline. I tend to work in collaboration with my local teams and, whilst keeping to the original framework, am happy to play with the format. For example, CDR Berlin is a cross between CDR sessions and CDR Knowledge (featuring panels and discussions) and is produced with my friends Dirk Rumpff and Benny Savary who bring a wealth of talent and expertise to these events. CDR seems to provide a platform for experimentation. Copenhagen is the most recent residency, so I know this one is heading in the direction of Berlin's sessions - people are hungry for the break-down and dissemination of knowledge that this format brings. People love hearing not just what they are working on or what their friends are working on, but what the global CDR community is working on. The curation process is more and more paramount. The journey that the audience explores has to be masterfully created. An interesting development has been embedding CDR into festivals, namely Copenhagen's Strøm and Dimensions Festival Croatia. These give us the opportunity to embed the format whilst introducing projects around it. Can you tell us a bit about your musical background? How did you get into making music, and what instruments/gear have you used for it over the years? My core background is primarily in music production, beat programming and sound design. I started buying records in my early teens, a lot of electrofunk and a stealth mix between Egyptian Lover and Tears for Fears. Sundays became a weekly practice in optimum selection process at Groove Records in Soho, followed by a higher level of skill to get the records I had purchased into my house where 'education preceded passionate music consumption'. I don't think my parents ever clocked the rapidly growing collection of vinyl held under their roof. The gems were listened to on headphones and as often as possible, when my parents were not at home, to ensure my secret stash was not uncovered. This training came in useful. My listening sessions back then opened up my musical vocabulary and the headphone experience brought my attention to the detail in the mix, panning, hearing every bit of craft in the production. It made sense to take inspiration and go create. A Casio RZ1 sampling drum sequencer was my very first portal for experimentation. This morphed into my first true set-up at Uni, consisting of an Atari 520ST, Kawai K1 MkII, and a Casio FZ10M sampler, a 4 track and a bunch of effects. After university came my freelance programming phase, utilising the Akai S1000 sampler, Korg M1, and Akai MPC60 (other bits came and went, but that's another story). Working as a programmer gave me a great grounding in honing a craft and giving a context to the part I played in the bigger picture of a record's development. From programmer to band member and musical director of Attica Blues and a project studio that included an Emu SP12, Oberheim DMX, Fender Rhodes Mk 2, Arp Solina, and a Mac setup with a bunch of VSTs and premier versions of Live and Logic Audio. All of this and then some was routed into a Mackie 8-bus mixer. Fast forward and today my setup is a hearty project studio and portable blend of inspiration taken from all the above to also include Push, Maschine, iOS and a bunch of Format 500 goodies. What do you try to learn from an artist during a CDR discussion? As with the majority of people at CDR sessions, the artist in question is an individual on a career trajectory. Everyone is on this trajectory which is emotional, creative, evolving, sometimes lucrative, often painful. My approach is that when I'm on the couch, I have to remember that they each have unique experiences. I want everyone to see their artistry, no matter how long they've been doing it for, and to gain some insight into the fulfilment of this trajectory. It is an opportunity to share in their learning process and to inspire others to do the same. These conversations are a platform for sharing knowledge. Simple. What is it about producing or creating that has kept you running CDR for a decade? Every day a new day. Every sound a new perspective. Producing is an evolving beast. Taking inspiration from the past with a mix of forward thinking and naivety. That's something we can all learn from. CDR is an alternative take on music education in all its guises. I've always been passionate about sharing knowledge beyond how it gets dealt with in the classroom. CDR as an event has invented a new format for learning. And that process is evolutionary. Catch Tony in conversation with Ewan Pearson, next Monday during the 20 Jahre Kompakt pop-up store at Ableton HQ.